123 Ink Cartridges - Specialists in Epson, Canon and Brother printer inks with 5 star satisfaction, reliability speaking for itself. Our product range includes ink cartridges for every major brand of printer and an extensive range of laser toners, photo papers and original cartridges all 100% guaranteed. Offering many product deals for customers including free paper and cartridges. Customers and conversions, benefit from Free UK delivery with no minimum order. Airmail delivery to Europe is also available. With our popular Epson, Canon and Brother multipack cartridges we have very satisfied shoppers with an excellent conversion rate on leads. Datafeed available. 123 Ink Cartridges pays 12% commission on all sales of compatible ink cartridges. Laser toner commission is 6% and original equipment cartridges commission is 5%. Customers are given a 10% discount code to increase your repeat conversions. 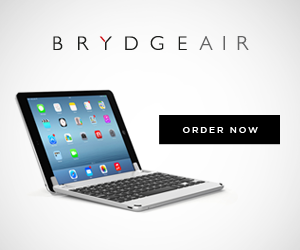 Brydge Keyboards - were originally a high performing "Kickstarter project" who have solidified their presence in the computer keyboard space by producing an exclusive, high quality range of premium iPad Keyboards that help you get the most of your iPad. Each one is forged out of a single piece of high grade aluminium or industrial strength Polycarbonate and with integrated stereo speakers, the Brydge range offers unparalleled quality and functionality. With a model to suit everyone's needs they are an essential for any iPad owner. I am sure your website visitors will love it. Our affiliate partners earn 10% per sale with a 90 days cookie tracking period. Currys PC World Business - can offer you three excellent reasons to put your links live ASAP: (1) Highly attractive B2B proposition with market leading prices from a well known and respected brand. (2) Exceptional commissions for you to push the product and an average order value of £250 with conversion rates on site of 3%! (3) Pro-active affiliate management from R.O.EYE supplying you with latest offers, newsletters, creatives and the flexibility to give you what is needed to make the programme work on your site! PC World Business now offers over 40,000 products with market beating prices and many products on next day delivery for in stock items. With your help we can achieve our business objectives: -To deliver a competitor beating service that exceeds customers' expectations. -To offer the UK's largest range of products, with the UK's lowest prices, backed by expert and professional service. Earn 5% on all sales apart from clearance. EasySkinz - are a company with 20 years international experience in advertising and design. EasySkinz is the place where you can find different and unique skins for smartphones, tablets, computers, laptops and game consoles. For those who are seeing this type of product for the first time, we will say, briefly, that this is an extremely effective way to transform your device, make it unique and different , change its colour and at the same time protect it from scratches, dust and dirt. Made in the UK - We believe that the success of one company occurs when the process is a closed circuit. That's why we take care of the entire process in our work—from development of design and production of the skins to packaging and delivering them to you. All our products are 100% manufactured in the United Kingdom. Materials - We, at EasySkinz, work only with the highest quality materials manufactured in Europe and the USA. As we always try to surprise you, amongst our range of products you can see one-of-a kind and unique skins such as our famous 3D Textured CARBON Fibre, 3M exclusive series and Chameleon designs. Global - We believe in the idea that the world is a small global village. We live in a time in which the mail is fast and secure (often parcels from England to America arrive within 3 days, and can be delivered to Germany in 24 hours). For this reason we offer very swift delivery—to every country in the world—at prices starting under 1 British pound. Earn 15% commission on sales. HP - offers the broadest range of IT products and services to consumers and business customers, from servers and computers to printers and digital cameras. Direct sales of these products to consumers and small and medium businesses are fulfilled via the HP Store (for consumers) and the HP Business Store. There are many exciting benefits for affiliates partnering with the Hewlett Packard program including a restricted keyword policy, a 90 day cookie and an expansive product feed and a very shortly there will be a Top Offers Ad tool feed. Other advantages available for affiliates on the Hewlett Packard program include deep linking, an above average CR%, frequent affiliate incentives and most recently enabled post impression sales. Earn 3% commission on B2C and 4% on B2B. Internet Ink - The one stop shop for ink cartridges, toner cartridges, writing pens with amazing customer service always included. Specialists in Epson, Brother, Canon & HP compatible ink cartridges with the original versions also held in stock. Our online store is fast, secure and offers free delivery with same day dispatch available. Internet-Ink are simply ink specialists. We offer high quality compatible printer ink cartridges for all major brands including Epson, Canon, HP, Dell and Brother. If you would rather purchase original printer supplies then you won`t find it cheaper anywhere else. If you want to save on printer ink you can use your returning loyalty customer 10% discount code on compatible printer ink only available at Internet ink. Place your order today & it will be delivered free of charge anywhere in the UK. Earn 5% commission on sales. Komplett.ie - is the best shop for all your electronics. Low prices, free shipping over €400,- and friendly customer service. Our main products are laptops, componenents, desktops, phones & tablets. Komplett.ie always offers great deals on the products. In the Komplett Outlet you can find brands you trust at one off low prices. Earn 2.5% commission on sales. Lenovo UK - Send your customers to the Lenovo UK web site to buy notebook and desktop computers (ThinkPad, ThinkCentre etc) and accessories (except Value models/accessories) and receive up to 5% commission when an online purchase is made. (Commission is based on the net selling price not including taxes, fees or shipping & handling. Excludes Returns made within 30 days of purchase). Lenovo UK is a customer-focused company with extraordinary resources and broad reach, providing you with innovative PCs and best-in-class customer service. We offer top-notch products, low total-cost of ownership, high productivity and the world-class support of IBM. Now, through the Lenovo UK affiliate program, those same products and resources are available to you. With our average order amount of GBP 800, you can take advantage of great new opportunities to build business, earn referral fees and attract new customers to your Web site. Earn up to 3% commission on sales. Logitech - Join the Logitech Affiliate Programme in the UK and partner with the world leader in personal peripherals. From mice and keyboards to PC gaming and home entertainment, Logitech is focused on creating innovative products that seamlessly get people into the digital world and keep them engaged and immersed. With the wide range of products that Logitech offers, you’re sure to find something for your customers. Our key product categories include: Mice, Keyboards, Webcams, Gaming accessories, Universal remotes, Home and PC speakers, iPod/MP3 players, Video security systems, Network music players & Earphones and headsets. Earn 3% commission on sales. Network Webcams - is a well established, well respected leading IP camera supplier and security specialist serving the UK and Europe. We offer customers free delivery, free technical support, configuration and installation and with a high average order value of around £500, large commissions are had by our many successful affiliates at 3%, rising to 5% per sale. Red Bus Cartridge Company - The Red Bus Cartridge Company can help you save on printing costs with our remanufactured toner cartridges. We are a British based company offering high quality remanufactured toner cartridges (not compatibles) from HP, Brother, Lexmark, Canon, Samsung and more, as well as FREE next day delivery and a full money back guarantee. Earn 10% commission on sales. Xerox EU - Whether you need to copy, print, fax or scan, in black & white or colour, there’s a Xerox Product or toner cartridge for you. The Xerox range of Products, Supplies and Services are sold and supported through direct and partner operations in all European countries. The Xerox Store Europe Affiliate program is focused on promoting the sales of Xerox Toner for Non-Xerox Printers ie. Xerox branded toner for Brother, Canon, Epson, HP, IBM, Kyocera, Lexmark, OKI and Panasonic printers. The current focus is on programs in Italy and France. Earn 10% commission on sales.